On November 27, 2007, Most Rev. Jacques Perrier, Bishop of Tarbes and Lourdes, France, announced the 150th Jubilee Year honoring the anniversary of the apparitions of the Immaculate Conception to St. Bernadette Soubirous. The Bishop came to the United States to share the blessings of Lourdes with all Americans. December 1, 2007, Bishop Perrier visited our Grotto of Lourdes in Emmitsburg and offered Mass in the Chapel of St. Mary on the Hill. Following Communion, the Bishop gave a wonderful talk and presented the Grotto with a gift from Lourdes. This precious gift was a Stone from the Grotto of Lourdes in France, excavated right near the miraculous spring where the Blessed Virgin told St. Bernadette to dig and receive water. 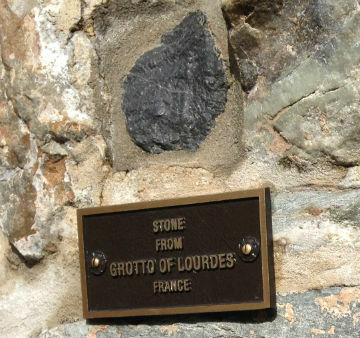 The Bishop said he was giving us this stone to "spiritually connect" us to the Lourdes Grotto in France and requested that it be placed in our Grotto, thus making us all members of the Lourdes Family. The Stone has been installed at the Grotto Cave and is there for all of us to see and touch.